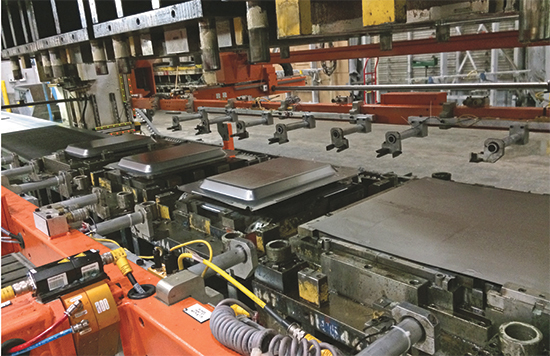 A 2600-ton Verson transfer press has new life at the New Standard Corp. (NSC) manufacturing facility in Hellam, PA (just outside of York), thanks to the recent retrofit of a new full-servo transfer system brought in to replace an aging servo-mechanical unit. In mid-2013, NSC outfitted its monstrous 2600-ton Verson—262 by 72 in. bed size— with an HMS Series 900 HD three-axis servo-transfer system, to address reliability and repeatability issues with an aging servo-mechanical transfer system. “We rode that pony for a long time,” says NSC program manager Greg Eisenbach, describing the previous transfer system installed on the press some 12 years ago. In mid-2013 the firm replaced the unit with an HMS Series 900 HD transfer system, to address reliability and repeatability issues. The press variety at NSC-Hellam (NSC also operates a plant in Rocky Mount, NC) runs the gamut, from a 45-ton 28- by 18-in. Clearing to the monstrous 2600-ton Verson—262 by 72 in. bed size. More than 100 NSC associates tend to the 180,000-sq.-ft. plant’s pressroom. The customer mix: 25-percent HVAC—compressors, heat-exchange bundles, etc., 25-percent agricultural, 20-percent heavy truck and bus, 15-percent appliance and five-percent automotive. Much of the work runs in hand-fed single-hit dies, which greatly impacted the design of the new transfer system, explains NSC planning engineer Graham Zifferer. To enable NSC to change dies using a tow motor, and to run hand-fed work in addition to transfer dies, HMS designed and built its transfer system unit to lift up and out of the with an unprecedented 130 in. of lift. Further, the NSC project team requested that HMS design the system with removable parking brackets with quick-change capabilities. Further, the NSC project team requested that HMS design the system with removable parking brackets and 400-lb. transfer-system crossmember with quick-change capabilities. The brackets secure the 400-lb. transfer-system crossmember. Typically, the parking brackets are static, mounted either to the press bolster or the tooling subplates. 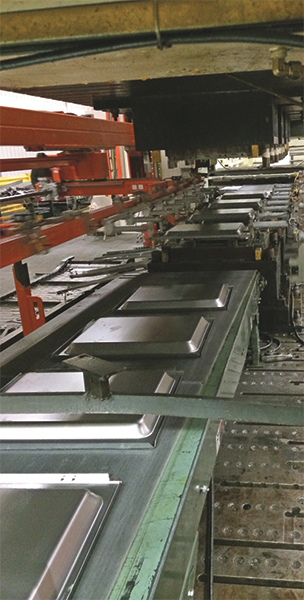 “We needed the parking brackets to be removable,” says Zifferer, “to provide optimum access to the dies and enable hand-fed operations.” The press runs 75-percent transfer work, 25-percent hand-fed work—typically large stampings such as truck fenders run in batches of 1000 or so. To ensure that the crossmember can’t be released without the parking brackets in place, HMS included an interlock system. Sensors in the brackets signal that they’re in place before the crossmember is allowed to disengage and park on the brackets. Transfer jobs now are running full speed ahead at 20 strokes/min., double the speed possible with the previous transfer system. And, the new transfer system features 30 in. of adjustable clamp stroke and 48 in. of lift. It’s als nice when retrofit technology allows old dies to run better and more quickly. It’s icing on the cake when added capacity attracts new work that previously could not run on a press. Such is the case at NSC, thanks to the enlarged work envelope resulting from the HMS transfer system.